The Wyvern is based on documents detailing the design of the ancient Raata empire's seafaring flagship, the Oryioni-Haru. According to historical sources the ship was traditionally taken on parade runs between the continent of Tikiona and the Muriyuke archipelago, seat of the Emperor, and represented the pride and joy of what would one day become the Caldari State. Today's starfaring version gives no ground to its legendary predecessor; with its varied applications in the vast arena of deep space, the Wyvern is likely to stand as a symbol of Caldari greatness for untold years to come. 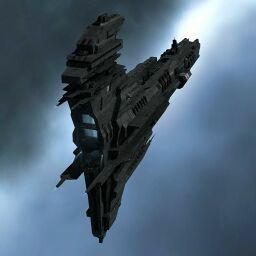 The Wyvern is the shield equivalent of the Amarr Aeon class supercarrier. In the current capital meta, shield is not used as much as armor for a multitude of reasons, however a true shield versus armor full on capital brawl has yet to manifest in recent days to sort out the answer of "shield or armor" for supercapital fights and settle the score. Its tiny fighter hanger bay limits its general utility but can still do acceptably depending on the scale of the engagement. Further information about additional or recommended skills to pilot Wyvern for a specific or it's common role(s) can be written here. Warp Disruption, Stasis Webification, or Energy Neutralization Burst Projectors are all worthy candidates for a burst projector. Carry Drone Damage Amplifiers and other modules to augment your damage. Always jump in full tank fit. Genolution implant set highly recommended; SM-70x implant suggested too. 42.9M EHP with Genolution implant set and SM-706 equipped. Vulnerable to neuting like all other shield capital ships, in respect to its tank. Carry passive refits. 58.2M EHP with maximum strength Command Ship links, cold. A similar variation drops one Capital Shield Extender for a Pith X-Type Thermal Dissipation Field, or runs passive EM and Thermal hardeners but retains the Pithum A-Type AIFs. No sub-article about Wyvern roles or piloting tactics. You can write them here. You can write additional notes for Wyvern here. This page was last modified on 16 April 2018, at 11:31. This page has been accessed 64,298 times.